"This image is showing Saturn coming out from behind the Moon"
Welcome to AUIT's Site of the Month for NovemberDecember, the last site I'll be featuring for 2009. As always, in December, a Review of 2009 issue will highlight all the previous Site of the Month publishings as well as recap the major astronomical events of the past year. 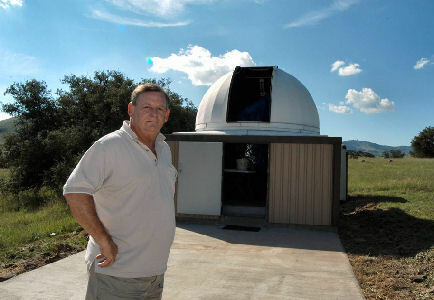 As for our last issue this year, we're headed out to Fort Davis, Texas for a look at Loyd Overcash's DeerRidge home observatory and skyshooter website. Amateur astronomy has, over the last fifthteen years, grown to such an extent that it has become not only a viable and credible resource of present day science but has developed into a scientifically endorsed category in its own right. One only need open the cover of any astronomy magazine, browse any official or private website or peruse the image credits at the Astronomy Picture of the Day website to find proof that the "amateur" has become a scientific force and self-sustaining institution of its own. Historical roots aside, this growth of private astronomy is due almost single-handedly to the technological advancements made in the 20th century; technologies that have since been incorporated into the lives of virtually every human being on this planet. With the invention of the telescope by Hans Lippershey and Galileo's improvements and subsequent use of it to view the planets, a turning point in the science of astronomy had been reached, for it placed into the hands of the everyday individual a capacity to peer out and into a realm that was once nothing more than a fixed and changeless curtain of twinkling lights, allegorical tales and scientific misunderstandings that reached down to the very heart of human beliefs. By the 18th and 19th century, our view and knowledge of the universe changed and by the early 20th century, we had begun to develope a sense of our place within it. But not until recently have we been able to acheive, on a personal level, that inspiring awe gained by looking into the vastness or beauty of the great cosmos. Today the universe is no longer the unknown it once was nor is it the sole province of scientific institutions, for with this century came a technology that was not only afforable but capable of observing and imaging objects residing millions of light years out in all directions, bringing the complex and almost unfathomable universe right down into the backyards of individuals like Loyd Overcash and his DeerRidge Observatory. Pierre François-André Méchain (17441804) was a French astronomer and surveyor who, along with Charles Messier, discovered and recorded many deep sky objects and comets, including the Sunflower Galaxy (M63 or NGC 5055 seen left) discovered by Méchain in June of 1779, and included into Messier's famous catalog; as are 25 other stellar objects Méchain had discovered. He later became editor of the French journal Connaissance des Temps from 1785 to 1792, and it was within the pages of that publication that Messier's list of stellar objects first appeared. Two hundred and thirty years later, the Sunflower Galaxy again found itself under observation, not from atop the tower of the Hôtel de Cluny in Paris, France but from a small rise in an open area within the hills of Fort Davis, Texas. The observer is Loyd Overcash and while he also employed a telescope to observe this galaxy, his is a much more powerful and advanced instrument, recording the event not on paper but on the electronic medium of a CCD imager. fn1 Becuase the early telescopes of Méchain's time were not powerful enough to fully resolve the galaxies under view, M63 was described as a "Nebula discovered by M. Méchain in Canes Venatici. M. Messier searched for it; it is faint, it has nearly the same light as the nebula reported under no. 59 [M59]: it contains no star, & the slightest illumination of the micrometer wires makes it disappear: it is close to a star of 8th magnitude, which precedes the nebula on the hour wire. M. Messier has reported its position on the Chart of the path of the Comet of 1779." As is obvious from Loyd's beautiful image of M63 above, taken from the observatory in his spacious backyard, he had no problems resolving this Sbc spiral galaxy located 37 million light years away in the constellation Canes Venatici. It wasn't so long ago that spending some time relaxing in a comfortable chair on the front porch, a simple Mead Refractor in front of me, was a nightly routine. The telescope was fair and observering the lunar surface was very rewarding. Over time and with a small amount of patience I was even able to see the moons of Venus and the Pleiades, with it's blue reflection nebula, appear in that little eyepiece. The downside to the whole affair was that if anything bigger than a chigger dare step on that front porch, my viewing experience turned into a kaleidoscopic nightmare. My one advantage however was that I lived atop a mountainous region in northern California that was very lightly populated and hence, I enjoyed decently dark skies. So, chiggers and kaleidoscopes aside, it was still a very rewarding endeavour. Q: Is your location within the surrounding hills (as seen in your panaromic image above) the "DeerRidge" area itself; I am not familiar with that part of Texas but you must have some wonderful dark skies up there? A: The Deer Ridge Observatory is named after the country road where it is located which is just outside of Ft. Davis Texas in Limpia Crossing - only 7 miles from the McDonald Observatory. This area has numerous amateur astronomers drawn here by the darkest skies in the Continental United States. Seen at right is an image of NGC 1514 that Loyd took in January of 2008. He notes that this is "...a planetary nebula located in Taurus. It has a bright inner shell with a faint outer shell. The bright star in the center of the nebula makes it a hard object to image. It is about 2300 light years away." When speaking of this particular stellar object, the National Optical Astronomy Observatory website notes, The morphology of this nebula is currently thought to be determined by a binary star (instead of a single star) in the center. Indeed, based on the likely masses of the progenitor stars (and possible separation) astronomers estimate these stars would orbit each other with a period of 4 to 9 days. If there are two stars at the heart of this nebula the more massive one, which eventually shed its outer envelope, was probably 3-4 times as massive as our Sun. 1. The CCD or Charged Coupled Device is a specialised type of integrated circuit (IC) which is located just behind the camera's lens. Due to the IC's efficiency, adaptability and low cost, the technology has spread very rapidly, seeing wide spread use amongst amateur and professional astronomers for nearly all UV-to-infrared imaging and guiding applications. Q: Can you tell us a little about your observatory, its instruments and the equipment you employ (its construction etc). A: The main observatory building is relatively small - 12 ft. x 12 ft. with a 10 ft. Home Dome mounted on top of the building. The current telescope housed in this building is a 14.5 inch RCOS Ritchey-Chretien with Ion Milled optics. It has the TCC system with an instrument rotating package. I use the SBIG STL-6303 camera on this telescope setup. I have a second smaller dome - a 7 ft. Astrohaven clam shell that houses a 5 inch Takahashi refractor. I use the SBIG ST-10XME on this setup. I can operate both telescopes from the observatories or remotely from my home which is approximately 100 yards away. On many occasions, I run both telescopes at the same time - each trained on a different object. 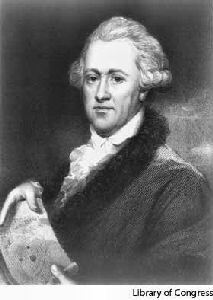 Seen in the image above left is a painting of William Herschel courtesy the Library of Congress collections. The Center image is of Sir William Herschel's forty-foot telescope at slough, 1876, from the collection of The New York Public Library. Image right of Loyd Overcash and his Observatory © Loyd Overcash. In addition to his observatory and location, I asked Loyd if he wouldn't mind telling us a little about himself and his pursuits in astronomy. Q: When did you create your web site? A: The skyshooter.net website was created five years ago in order share my love of astronomy with others. As my imaging skills improved - so did the quality of the website. It is a work in progress - constantly being updated with new images. Q: How long have you been pursuing the hobby and science of astronomy and what originally sparked your interests in the universe and astrophotography? A: I rekindled my fascination with astronomy approximately 20 years ago with the purchase of a home on a mountaintop just outside of Ft. Davis, Texas, near the McDonald Observatory. A short time later, construction began on my personal observatory. I have had numerous telescopes leading up to the equipment I have today. Two years ago, I added the second observatory so I could image wide field and deep sky images at the same time. I have been a professional photographer in the Houston, Texas area for over 35 years. With this background, and my love for astronomy, astro-imaging was naturally the next thing for me to do. Q: Are you active in other astronomical groups, clubs or societies? A: I am involved in both Houston and Ft. Davis astronomy communities In Houston I am a member of the Houston Astronomical Society, North Houston Astronomical Society and Ft. Bend Astronomy Club. When I am in Ft. Davis, I volunteer at the McDonald Observatory where I help out with their Star Parties at the Visitor Center. Q: What is or are your favorite stellar object(s) or image(s)? A: My favorite objects to image are galaxies and nebulas. I love to try to capture the details in the galaxies and the beautiful colors in the nebulas. It is hard for me to pick a favorite because they are all unique but M81 and M51 are my favorite galaxies. Of course my favorite nebulas are the Horse Head and the Great Orion Nebula. Q: In your opinion, what has been the importance or lasting contribution that the study and science of astronomy has given to you or perhaps, humankind in general? A: One of the most important and lasting contributions to astronomy will be the images taken by the Hubble Space Telescope. Even if a person knows nothing about astronomy, the images from the Hubble will make them stop in awe. Q: What are, for you, the most important benefits gained from your observations of the universe or, closer to home, our solar system? A: The ability to share with others the beauty of the universe and be able to peek the interest of young minds My reward for volunteering at star parties is to listen to the comments of people (young and old) when they put their eye to the eyepiece of a telescope for the first time. 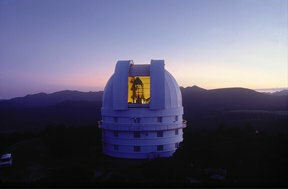 Q: I noticed a picture of you with the 82-inch telescope at the McDonald Observatory. Can you elaborate a little on that trip? A: I volunteer to help with the star parties at the McDonald Observatory as much as possible. I have been fortunate to work on the 82 inch telescope programs on numerous occasions. When you look thru the 82 inch telescope at a nebula, you can visually see all the color that most of the time is only shown in photographs. If you ever have the opportunity, you should sign up for the viewing session thru the 82 inch telescope at the McDonald Observatory. Who knows - you may see me there! Let's now head over to Loyd's backyard and have a look at what he's imaged over the years from his home observartory at DeerRidge. Seen in the foreground at left is the smaller 7-foot diameter, fiberglass clamshell Astrohaven dome that houses Loyd's 5 inch Takahashi refractor and SBIG ST-10XME CCD Camera. The Takahashi FS-128 telescope is a very portable 5" apochromatic type refractor that has been well received by astrophotographers over the years. 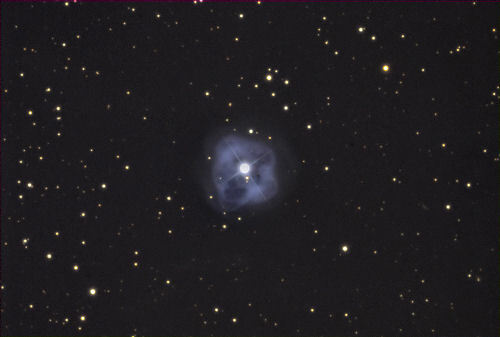 When attached with a SBIG (Santa Barbara Instrument Group) ST-10 series camera, Loyd has a full frame resolution capacity of 2184 x 1472 pixels, which is ideally suited for use in wide field astrophotography, as well as a very capable and compact observatory, as the following images illustrate. "Total Lunar Eclipse taken from North Houston on 10-27-04 at 10:05 pm. Image taken with the Nikon D-70 and the Takahashi FS-128 at prime focus. It is a 8 second exposure at 200 ASA."  Loyd Overcash describing the below image. One of the most inspiring and breathtaking sights of a full lunar eclipse is the range of colors the moon can take on; a result of the earth's own atmosphere. During a lunar eclipse, while the moon's surface is in the Earth's shadow, a certain amount of indirect light still reaches it. But the light must first travel through the dust and clouds within the Earth's atmosphere (which also bends or refracts the light) and this causes the shorter blue wavelength of light to scatter. What remains is light that is mostly within the red portion of the spectrum, causing the moon to reflect colors from dark brown and red to bright orange and yellow. If the Earth had no atmosphere, then the lunar eclipse would be nothing but a dark or black shadow. This also occurs when our atmosphere contains a large amount of ash from a volcanic eruption. This was the case during the lunar eclipse in December of 1992, when Mount Pinatubo erupted and caused an extremely dark lunar eclipse. Shown at right is Loyd's excellent example of the deep, rich color that can occur during a full lunar eclipse. Orbiting Saturn at a distance of 745,000 miles is its largest moon Titan. Recent satellite surveys have confirmed that it is also the only other object in our system that has bodies of liquid on its surface in the form of Methane, a flammable gas kept in a liquid state by the moon's extremely cold tempeture of minus 300 degrees Fahrenheit. While Titan may be the second largest moon in the solar system, it is still dwarfed by its parent, a planet that is without a doubt our solar system's most striking and astrophotography's most iconic ever. 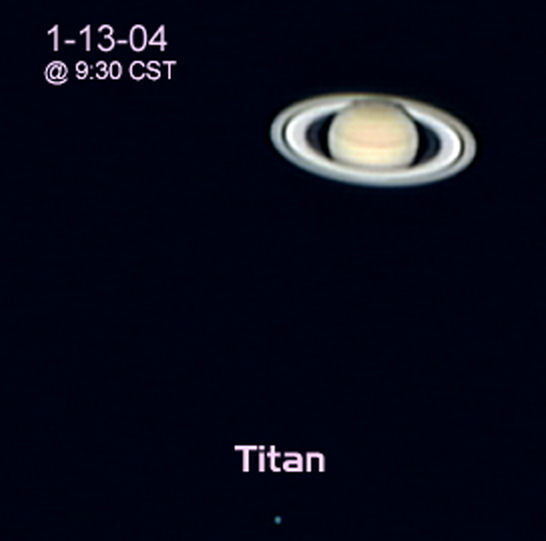 At left is Loyd's image of Saturn and Titan as seen through his Takahashi telescope. 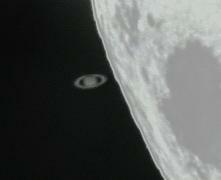 "This image of Saturn was taken from Houston TX, on 1-13-04 @ 9:30 CST. It was taken with the Takahashi FS-128 with a 2.5 powermate & the Philips ToUcam PRO II. 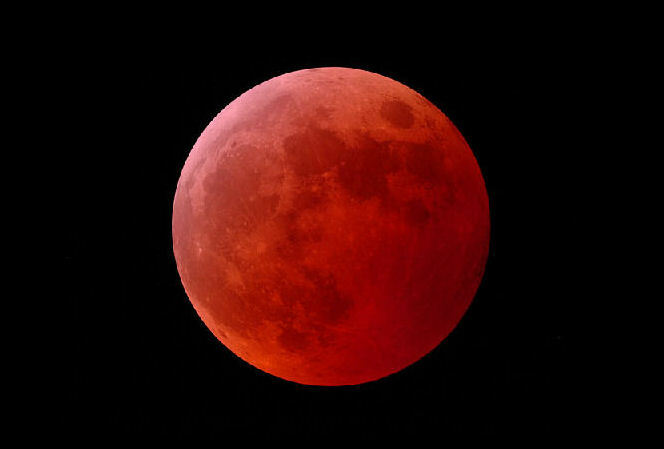 Seventy-Five of the best images [were] aligned and stacked using RegiStax." For this particular image, Loyd employed a device commonly known as an image amplifier, Televue's 2.5X Powermate (an extension and improvement upon the older Barlow lens device). When fitted with an adapter, cameras and CCD imagers can be coupled to the eyepiece for astrophotography use. The image was taken with a Philips ToUcam PRO II that was attached driectly to the Powermate eyepiece. The ToUcam PRO offers better than average low light performance, excellent image resolution and clarity and the ability to take images via voice command. In order to create this particular image, Loyd used a program called RegiStax, a free software package developed for astronomers in order to process, enhance and produce a single, clear image. It works by taking multiple images of the same object and aligning them (through specifically choosen points within the image) and averaging the "stack" together. The averaging process allows you to increase the signal-to-noise ratio of the image and overcome geometric distortions due to atmospheric turbulence. If you'd like to see additional images created by Loyd, just drop by his skyshooter website and click on the Solar System button. We continue by looking at examples from Loyd's other image categories: Nebulae, Clusters, and Comets.